I had already reviewed BursonAudio's integrated power amplifier when I was offered their Pre-100 pre amplifier to try with it. Burson have designed (and tuned) the P-100 specifically to go with the PI-100, although it will work well with a lot of other power amplifiers too! The appearance of the Pre-100 is almost identical to the PI-100 so the two look good together on the rack. Once again, the case has a slightly DIY look to it as Burson's policy is to provide the best sound quality that they can while keeping their products as affordable as possible. You need to keep this in mind when buying the Pre-100 (or the PI-100). If you want a much better case, you will find yourself paying out a lot more than the Pre-100 comes for! The plain aluminium look is clean and doesn't offend. The controls on the front panel do nothing to break up the clean lines. The internal layout is also neat and tidy with the custom transformer 'tidied' away in its own housing. What you get with the Pre-100 is Burson's proven philosophy. 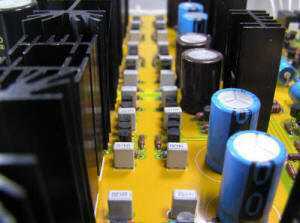 That is attention to detail, by way of a low-noise power supply using a custom transformer. 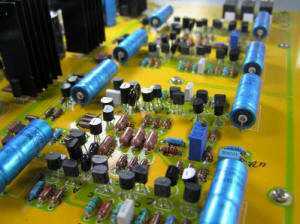 The extensive use of discrete components with not a single opamp to be found anywhere. Matched transistors, and carefully selected components complete the recipe. Volume control is by way of an Alps Blue potentiometer, while input selection is achieved using relays adjacent to the input sockets as part of their philosophy of maintaining the shortest signal path. And there are two pairs of output RCA sockets although the labeling is a little confusing. I value these extra sockets as it allows me to easily connect both the power amplifier, and the second amplifier that powers the woofers. Essentially what the Pre-100 is, is a more advanced version of the Burson Buffer using the HDAM modules, but with an added gain stage, source selection and volume control built in. As such, having reviewed the Burson Buffer, I wasn't surprised that adding the Pre-100 between my modified Philips CD723 and various amplifiers including some home-built Gainclones, Autocostruire and Charlize class-T amps, made quite an improvement due to the much better impedance matching that is achieved. The Pre-100 is quite neutral and transparent, qualities we should hope for from a pre amplifier. Well, I raved about the Burson buffer, and nothing has happened to make me change my mind on that. I know there are many very satisfied BB owners out there, and Bolder Cables now recommend the Burson Buffer to go after their modified SB3. But the Pre-100 is much more than a Burson Buffer as the following diagram illustrates. Burson have taken things to another level with the Pre-100. For a start, it is a completely dual mono design including the power supplies. While the design of the Burson Buffer only permits a gain of 6 db, the Pre-100 has a separate voltage gain stage with 10 db of gain. Of course, both gain and buffer stages use discrete components instead of opamps. The voltage gain stage is even manually biased like a power amp. And of course, the Pre-100 allows you to connect three sources, and has the volume control. The real test in this review was to pair the Pre-100 with the PI-100 which I did in my main system! To be honest, the PI-100 really needs either the Burson buffer, or the Pre-100 to bring out its full potential. Without them it can sound a bit on the thin side! The PI-100 has one input that bypasses the internal volume control and it was to that I connected the cable from the Pre-100. Together however, the PI-100 shows what it is capable of. For this review, I was using a Slim Devices Transporter and using the digital volume control. Being used to no other volume control, I did notice the signature of that Alps Blue pot when I used the Pre-100 instead of the Burson buffer (that doesn't have a volume control). But if you don't have a volume control on your source, you will need one of some sort, and the Alps Blue is certainly one of the better options. Apart from the signature of the volume control, it was hard to 'hear' that the Pre-100 was in the system! The only other 'negative' I noted was that the source selection is a bit noisy when switching between one input and another. This does nothing to degrade the sound quality while you are listening though. Summing up the Pre-100 is another fine offering from BursonAudio. 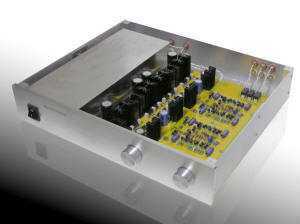 It compliments their PI-100 power amplifier perfectly, but will also work well with most, if not all, power amplifiers. As usual, most resources have gone into producing a high quality sound rather than an attractive appearance although that's not to say that the Pre-100 isn't attractive. And if you want this level of electronics, and a top-notch housing, you are looking to pay much more than the asking price of this product!